Ireland is the name of the island, one island with an area almost the same as Portugal’s, where two countries are, with two different currencies and without physical borders. The Republic of Ireland is the name of the country that takes most of the island, and that holds the northern and southern points, as well as the western and easter ones. This country is part of European Union, and uses the euro as currency. For those coming from other EU countries it makes things easier, no conversions to think about! Northern Island is the remaining part of the island, in the Northeast of the island. And it is a country part of the United Kingdom. Yes, it is considered as a country, with a local semi-independent government, though under the British crown. The local currency is the British pound, alike the rest of the United Kingdom, but with a slightly difference (which also happens in Scotland, and if I am not mistaken also in Wales), each bank can print their own notes. Yes, there are several different notes for the same amount, it is quite confusing! And it is even more confusing when you try to use those notes in other parts of the United Kingdom, which are often declined by shops and other entities. However, the coins are all common to the four countries of the Kingdom. 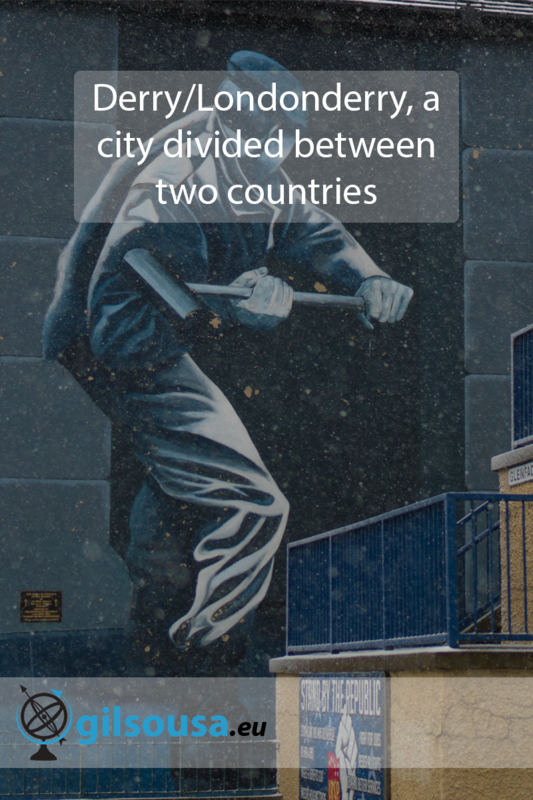 Derry is on of those points of conflict, right in the border between the two countries. Nowadays with a big majority of catholic population, around 90%. However this city is part of Northern Ireland, even if the majority of the population wants otherwise. This city is even more unique, it’s official name is Londonderry, as a tribute to the Londoner builders, though most of the population refuse to accept that name. Therefore they use the anglicized name Derry, with origin of the irish word Doire, which means oak orchard. Before my trip to Derry, one of the recommendations I’ve heard was to be wary of the way I would refer to the city’s name, considering I could easily offend someone. It seems this is not true, actually, maybe yes but just a minority of them. The Irish are extremely nice people and they love visitors. Speaking with an Irish about their city is a way compliment, and no one declines an opportunity to explain a bit more about their city. And from that point on, it is just a matter of respecting the name they prefer for the city. However this wasn’t always like that, on the 30th of January of 1972 a big incident happened where 14 people died, 13 right on spot and another one 4 months later due injuries. These people were killed by the english arm during a catholic peaceful demonstration, against the Operation Demetrius. In this operation 300 people were detained without trial, 300 catholic Irish who defended the union of Ireland. This unfortunate event was the root of other kind of demonstrations, but this time artistic. Several artists kept the memory alive of what happened on this day through music. One of those most known songs is the U2’s Sunday, Bloody Sunday. According to our guide, religion was just an excuse used by the queen (his words) to divert the attention from the unionists. While they are all Irish, all part of the same Ireland (island), only religion could be used as a factor of differentiation as they are “born” with it. Telling an Irish that he can’t be Irish makes no sense. But telling a protestant that it makes more sense to stay in a country of which the monarch is the highest entity of their religion, then the scenario changes. Branching a bit out of topic, the Republic of Ireland’s flag is a symbol of peace with Northern Ireland. The green symbolizes the catholic religion, a big majority on the island. The orange represents the supporters of William of Orange, a majority of protestants. And the white, obviously it means Peace. It is a message of inclusion to all the inhabitants of the island. Nowadays the younger generations don’t identify with this conflict, there is more harmony between both sides and less tension. I did two excursions in Belfast, and this one in Derry, and so far all the guides said the same. They can picture Peace being a reality soon. Union? Most likely not any time soon. But Peace? Certainly. But not all are bad stories. Derry has a lot to offer to those who visit the city. One of the things I loved the most was the city walls, which are really wide! Derry is one of the oldest cities in Ireland, with a continuous population. Right since the VI century! It is the only city in Ireland with the city walls still intact, and it is considered as one of the best city walls in Europe. For a Portuguese like myself, I have to admit I really did enjoy walking on those walls. Thankfully in Portugal we have a lot of walled towns. It is also one of the very few European city that never had its walls penetrated. It survived several sieges including one that lasted for 105 days. Hence also being known as the Maiden City. When you plan your visit to Derry, take into account the religious dates and other events, and the days when the museums are open. While I usually recommend to visit cities during off season, smaller places like Derry often decide to close their museums when the flow of tourists is much lesser. It does not pay off to keep a museum open if the income is low. And due to that, unfortunately we couldn’t visit the Museum of Free Derry. And if time allows, take a detour and visit some of the rural areas around Derry. Between Donegal county in the Republic of Ireland and the county of Derry / Londonderry, there is a lot to visit.